Sysco Houston was recognized with the Signature Account Award of Excellence by the Certified Angus Beef ® brand. 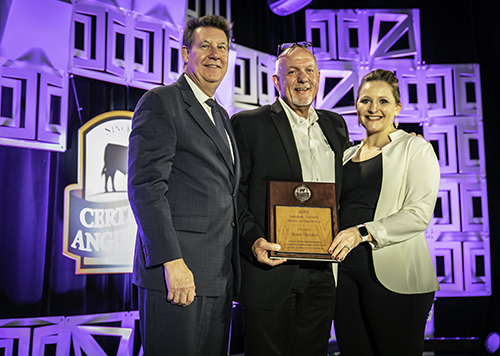 Presented at the brand’s annual foodservice seminar, the award recognizes the foodservice distributor’s leadership in delivering premium beef to restaurants where top-quality steak offerings are a priority. The team at Sysco Houston, led by Certified Angus Beef® Specialist David Garrett, has long been a leader in serving high-profile steakhouses and signature restaurants in the market. This year, the company hosted a ranch day for customers to learn about beef quality from farm to table. Chef leaders also visited the beef brand’s Culinary Center in Wooster, Ohio, to work one-on-one with meat scientists and chefs to explore best cuts for the menu, develop signature dishes using those cuts and then prepare them with the brand’s chefs as new menu items for their restaurants. Sysco Houston was chosen from distributors who represent the Certified Angus Beef ® brand to chefs and restaurant owners throughout the United States and 50 other countries. The team leads beef consultation, wait staff training and marketing solutions for restaurants to feature the finest beef.